Private Alf Davis was one of hundreds of servicemen from across the country who penned messages in two visitor books at the Peterborough East Railway Station as he passed through the city on his way to fight in the First World War. His story came to light when the visitor books were unearthed in the city’s archives in Peterborough Library and a project began to find out more about the lives of the 580 servicemen whose fleeting thoughts are preserved in the two slim volumes dating from 1916 and 1917. This marked the start of a project to find out more about the lives of the servicemen whose messages are preserved in the two slim volumes. And researchers are now trying to trace anyone who may be able to help fill in more of the story. Richard Hunt is head of cultural development for Vivacity Culture and Leisure, which manages Peterborough’s libraries. He said: “The books just look like school exercise books, but they contain 580 of the most remarkable stories. For some, they only left a signature, but others left a poem, or a drawing, or a few more thoughts. “The soldiers would have been very young, wet behind the ears, who may have thought going to war was a bit of an adventure. Pte Davis wrote in the book twice – once, just his name, on the way out to the war, and once, as a civilian, after his service ended. His words are alongside other soldiers’ writings – including an incredible sketch of Charlie Chaplain. Volunteer Glynis Titman said: “We are looking through various family tree and ancestry websites to trace the stories. On some we can find a lot about the men - their families, what happened to them in the war, what they did before the war. Sadly for some they did not return, and it is possible to find out what happened to them. Beverley Jones, project officer said: “The books were set up in tea rooms by the Women’s United Total Abstinence Council (WUTAC). The women offered them comfort, tea and cake, and the soldiers showed their gratitude by writing messages in the book. The project has been given a £9,000 grant from the Heritage Lottery Fund. An exhibition will open at Peterborough Museum in January 2018, to bring together and display the research and information that has been gained, using a variety of media including creative writing, recorded performance, audio and digital projection. The website launches in advance on Wednesday, January 13, to give descendants the opportunity to share information and photographs of their relatives to add to their story. 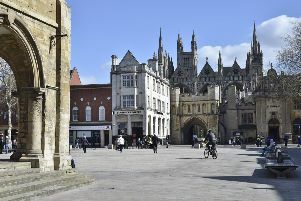 Those wishing to find out if their ancestor wrote in the books will find a list of their names and service details on the website at www.peterboroughww1.co.uk. Pte Davis was born in Whittlesey in 1896. He inadvertently shot and killed a colleague, Cpl Arthur Cecil Rawson in 1914. It is believed to have been the first incident of a death by ‘Friendly Fire’ in the UK. The accident took place before Private Davis left for war when, as the men slept, the button of his greatcoat caught the trigger of his rifle and a shot was fired which hit Cpl Rawson – he died later. Private Davis went on to be awarded the DCM when he rescued a wounded officer in Belgium in 1915. In the process he himself was badly wounded and had to have his leg amputated. His niece, Joy Coster (57) from Milton Keynes was at the launch of the new project. She said: “I remember him as an uncle who was missing a leg. “We did not know any of the stories, or any details of how he lost his leg. “It is amazing to see his hand writing after all these years. It is so perfect and neat.